Windows 7 is much simpler to operate than Vista, and just as easy as XP Pro, except you've got an even cooler interface than Vista (which is pretty cool no matter how you slice it). Windows 7 also gives you more control over your computing experience. It provides a clean and uncluttered desktop, as well as more options than ever to customize and personalize your PC. You told us what you want in a PC. We listened. And made hundreds of little improvements and a few big ones that add up to a whole lot less. With Windows 7, we've made it easier to get more done on the desktop. Overwhelmed by open windows? Windows 7 comes with three simple yet powerful new features called Aero Shake, Aero Peek, and Snap to help you instantly clear through desktop clutter. Peek-a-boo: Aero Peek turns open windows translucent so you can see what's on your desktop. We spend a lot of time staring at our PCs. Aesthetics shouldn't just be an afterthought. That's why Windows 7 includes a slew of new desktop backgrounds—wallpapers—that range from sublime to silly. Or try the new desktop slide show, which displays a rotating series of pictures (ours or yours). Your desktop will never be dull again. Windows 7 makes it easy to express your personality with creative new themes and other custom touches. Since Windows 95, the taskbar has served as the go-to spot for launching programs and switching windows. Times and PC habits have changed. So in Windows 7, the taskbar has been completely redesigned to help you work smarter, cut clutter, and get more done. Improvements to the new Windows 7 taskbar include thumbnail previews of webpages, documents—even running video. Gadgets, the popular mini-programs introduced in Windows Vista, are now more flexible and fun. Based on your feedback, we've done away with the Sidebar, so you can stick your gadgets anywhere on the desktop. Favorite gadgets can go anywhere on your Windows 7 desktop. Note: Not all features mentioned above are available in all editions of Windows 7. See the individual feature pages for details. HomeGroup takes the headache out of sharing files and printers on a home network. 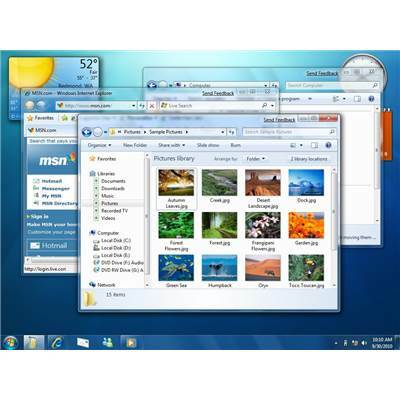 Connect two or more PCs running Windows 7, and HomeGroup makes it easy to automatically start sharing your music, pictures, video, and document libraries with others in your home. The new “Share with” menu, meanwhile, provides a speedy way to share individual files. Concerned about privacy? So are we. That’s why HomeGroup is password-protected and puts you in total control. You decide what gets shared—and what stays private. You can also make your files "read only," so other people can look at (but not touch) your stuff. What you see in a Jump List depends entirely on the program. The Jump List for Internet Explorer 8 shows frequently-viewed websites. Windows Media Player 12 lists commonly-played tunes. Your Jump List missing a favorite? You can "pin" whatever files you like there. Jump Lists don't just show shortcuts to files. Sometimes they also provide quick access to commands for things like composing new e-mail messages or playing music. What is Windows Live Essentals? Simply put, it's free software that makes a PC running Windows 7 do more great things. Things like e-mail, instant messaging, photo editing, and blogging. Chat instantly with friends and family on your PC or mobile phone. Find, fix, and share your photos. Manage multiple e-mail accounts (like Hotmail) in one place. Compose your blog, add photos and video, then post it on the web. Turn your photos and videos into great-looking movies and slide shows. Manage and monitor online activities so your kids stay safe. Search instantly from any webpage. In Windows 7, you can find more things in more places—and do it faster. Start typing into the Start menu search box—and you'll instantly see a list of relevant documents, pictures, music, and e-mail on your PC. Results are now grouped by category and contain highlighted keywords and text snippets to make them easier to scan. Few people store all their files in one place these days. So Windows 7 is also designed to search external hard drives, networked PCs, and libraries. Overwhelmed by your search results? You can instantly narrow them by date, file type, and other useful categories. Windows 7 is designed to sleep, resume, and reconnect to your wireless network more quickly. When you plug in a portable flash drive or other USB device for the first time, Windows 7 can have it ready for you in seconds. If you've used it before, the wait's even shorter. 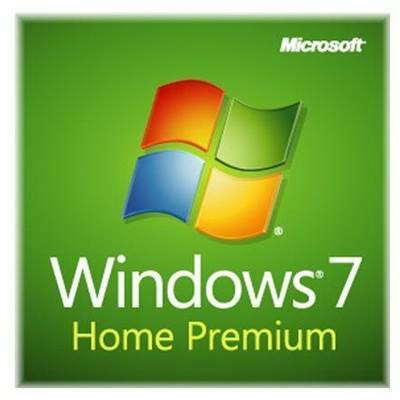 Unlike its predecessors, Windows 7 is designed to run speed-sapping background services only when you need them. Not using a Bluetooth device? Then the Bluetooth service in Windows 7 stays off. Windows 7 is also less memory hungry than Windows Vista—another under-the-hood tune-up that can boost overall performance. If you've gone PC shopping lately, you've probably noticed more computers with 64-bit processors, and you may have wondered what advantages they offer. Put simply, a 64-bit PC can handle larger amounts of information than a 32-bit system. Since it can use more RAM—4 GB and up—a 64-bit computer can be more responsive when you're running lots of programs at once. Which should you buy? If you tend to have a lot of programs open simultaneously or need to switch frequently between programs—or if you just want to be sure your PC can take advantage of the larger amounts of memory available today—64-bit is a great choice. If you run only one or two programs at a time or have older hardware and software that isn't supported by a 64-bit PC, a 32-bit system is a good choice. Whether you choose the 32-bit or the 64-bit system, Windows 7 is ready. To see if your PC is a 32- or 64-bit system, download and run the Windows Upgrade Advisor. Tired of your laptop dying when you need it most? Windows 7 is designed to help your battery last longer. How? For starters, Windows 7 runs with fewer background activities so your PC processor doesn't work as hard and draws less power. Other innovations include less power-hungry DVD playback (handy on long flights), automatic screen dimming, powering off unused ports, and a more accurate battery-life indicator. So you'll be less likely to be surprised by a dead battery. Leaner and greener: Fine-tune power consumption in Windows 7 to extend battery life. 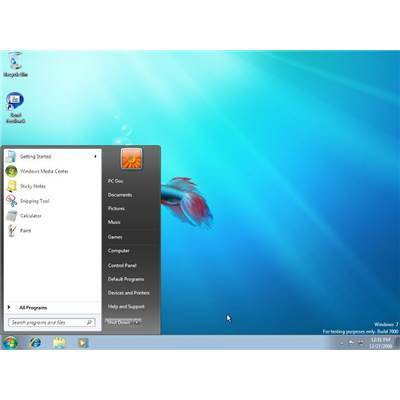 Windows 7 makes it a cinch to view and connect to networks on your laptop wherever you go. Just click the networking icon on the taskbar. View Available Networks displays all your wireless and wired options—Wi-Fi, mobile broadband, dial-up, or corporate VPN. One more click, and you're connected. Windows 7 instantly shows you wireless and other available networks. Watch, pause, and record live TV. Listen to your tunes. Show off your photo collection. Enjoy online entertainment. And do it all from your living-room couch. Is it any wonder critics call Media Center the hidden gem of Windows? In Windows 7, we've made it even better—adding great new features (many suggested by you) and visual touch-ups. 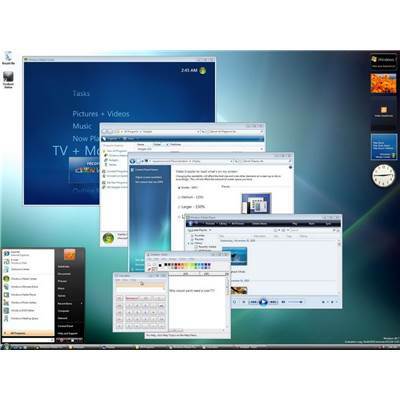 Windows Media Center is available in the Home Premium, Professional, and Ultimate editions of Windows 7. Windows Media Center supports more global TV standards and tuners, including digital and HD. It also now plays more popular audio and video formats—including 3GP, AAC, AVCHD, DivX, MOV, and Xvid. Tired of trudging through TV listings or a massive music library? Zip to songs and shows more quickly using the new Turbo Scroll feature. Make elegant photo collages (with background music) using the new slide show maker—perfect for parties or family get-togethers. And check out the updated slide show screen saver—its stunning visuals defy words. Enjoy recorded TV shows, music, video—even when it's not stored on your PC. The new HomeGroup feature makes media available to any PC with Windows 7 in the house. A new Media Center gadget. Quick video skimming. More song and show details. Bigger, easier-to-see preview thumbnails. The improvements go on and on. Move over mouse: When you pair Windows 7 with a touch-screen PC, you can browse online newspapers, flick through photo albums, and shuffle files and folders—using nothing but your fingers. Limited one-finger touch capability has been available in Windows for years. 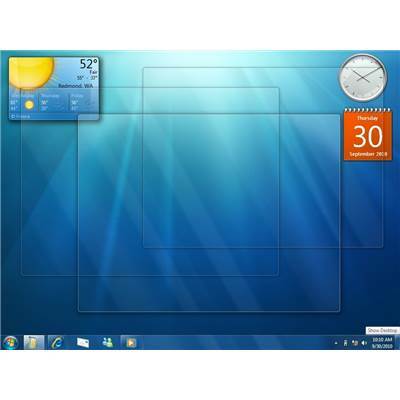 But Windows 7 is the first to fully embrace multitouch technology. Need to zoom in on something? Place two fingers on the screen of a multitouch-compatible PC and spread them apart. To right-click a file, touch it with one finger and tap the screen with a second. Windows Touch—available only in the Home Premium, Professional, and Ultimate editions of Windows 7—is fun to learn and easy to use. The Start menu and taskbar now sport larger, fingertip-friendly icons. All your favorite Windows 7 programs are also touch-ready. You can even finger paint in Paint! This is OEM FULL VERSION ENGLISH SEALED PACK, NOT a Retail Box version, picture for reference only! This software has NOT been activated, used, duplicated, or installed on any system. Its 100% Authentic software with 100% legal license and Certificate Of Authenticity. Microsoft OEM NEW RULES: With the new 1-pack, the unopened package can be distributed to another system builder by itself, without any hardware requirement. Microsoft's Distribution Agreement for System Builders states that OEM software must be distributed with either a fully assembled computer system or a non-peripheral computer hardware component. In accordance eBay's policy for listing an OEM item, your purchase will include an applicable hardware component. All eBay sales are final (software), no refunds or exchanges are available. S&H is non-refundable. Your quality product is protected via the manufacturer's warranty. To request more information on a product warranty prior to purchase you can check via the manufacturer's website or email us. Thank you! 1. Credit Card: Visa, MasterCard, Discover, American Express are accepted through paypal.com (Verified & Confirmed) ONLY!